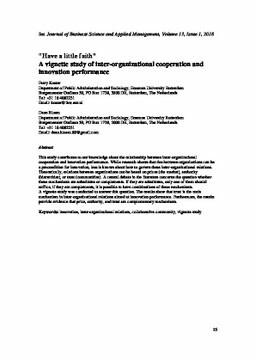 This study contributes to our knowledge about the relationship between inter-organizational cooperation and innovation performance. While research shows that ties between organizations can be a precondition for innovation, less is known about how to govern these inter-organizational relations. Theoretically, relations between organizations can be based on prices (the market), authority (hierarchies), or trust (communities). A central debate in the literature concerns the question whether these mechanisms are substitutes or complements. If they are substitutes, only one of them should suffice, if they are complements, it is possible to have combinations of these mechanisms. A vignette study was conducted to answer this question. The results show that trust is the main mechanism in inter-organizational relations aimed at innovation performance. Furthermore, the results provide evidence that price, authority, and trust are complementary mechanisms.